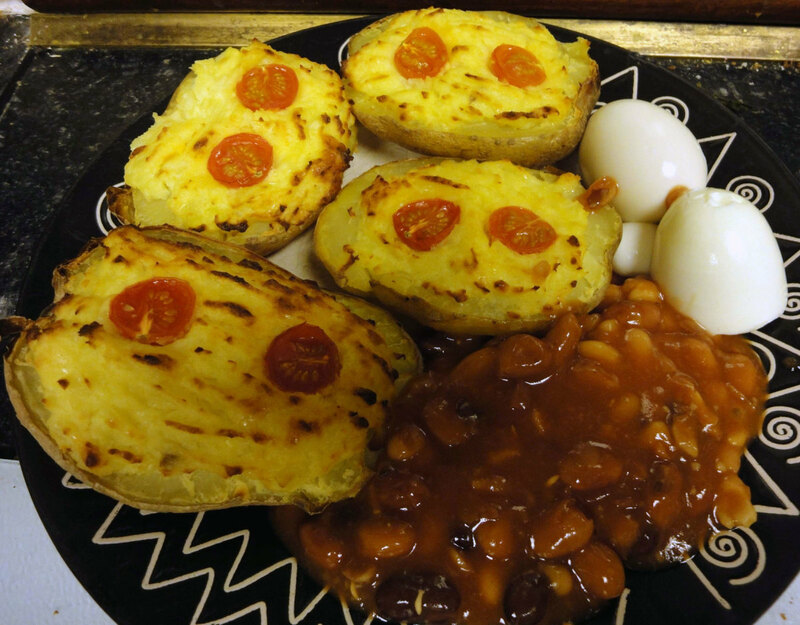 Could the baked potato be the world’s most perfect food? Think about it—one large potato costs less than a dollar. It's an inexpensive, filling, nutritious and easy-to-make food in the college dorm*, a handy dinner for one, or even comfort food for an upset tummy. (Bet you didn't know that). But that's not all. Multiply the number of potatoes, add a few simple toppings, and you have an easy weeknight dinner for your family. *NOTE: Yes I know that dorm potatoes are microwaved, not baked. However, even though a microwaved potato is not perfect, it is better for you than a bag of popcorn. 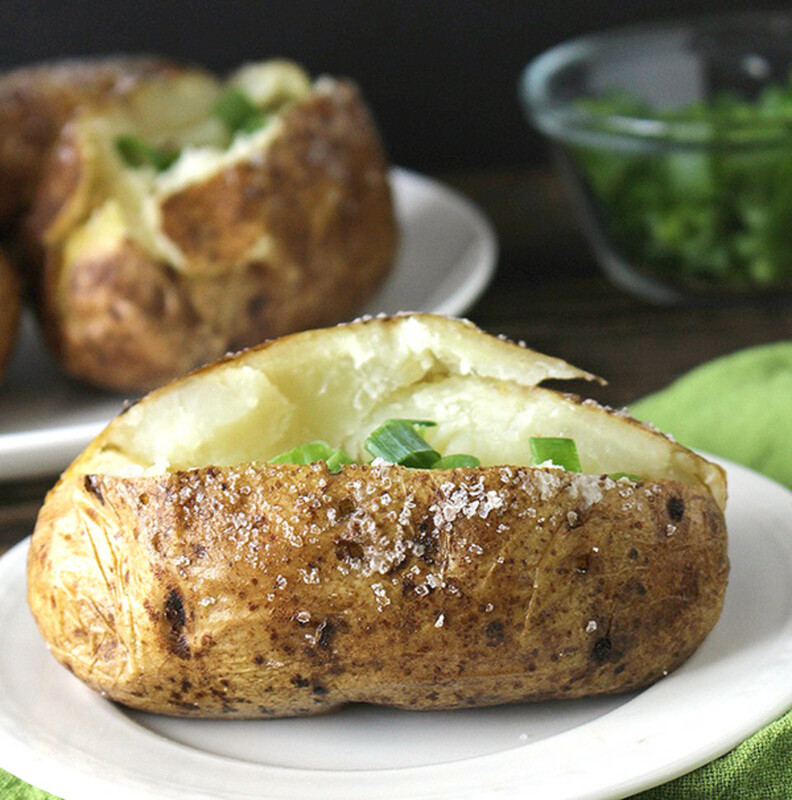 Before you create the perfect baked-potato meal, you need to have a perfectly-baked potato. Move the rack in your oven to the middle level. Scrub each potato with a stiff-bristled vegetable brush under cold running water, but don't let them soak in water. 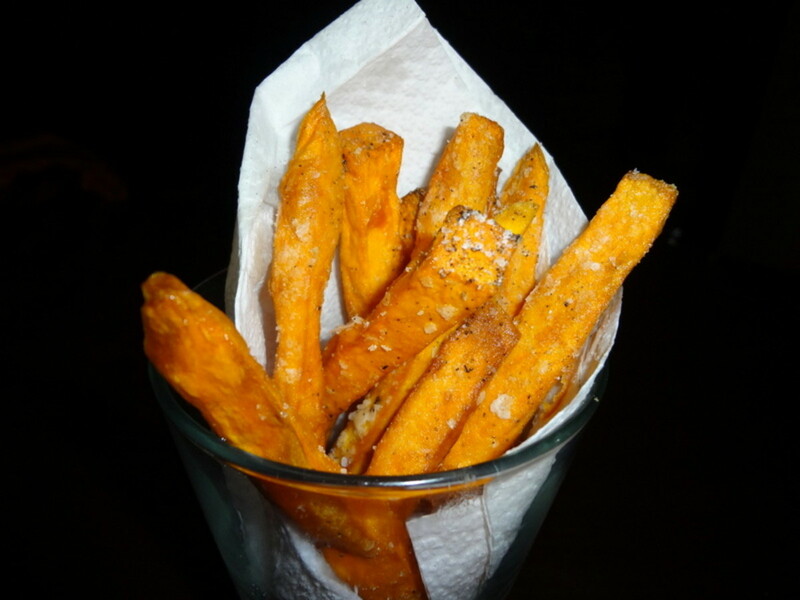 Dry each potato with a clean paper towel. Pierce each potato 4 times on each side with the tip of a sharp knife. Rub some olive oil on the skin of each potato and then sprinkle lightly with salt. Place prepared potatoes directly on the oven rack (no pan). Bake until tender (about 40 to 45 minutes). NEVER EVER wrap your potatoes in foil. If you do you will have steamed, not baked, potatoes. AND, always used russet potatoes; Yukon golds, reds, and other "new" potatoes are waxy, not starchy and so will never produce a potato with a crisp outer skin and fluffy interior. Everything you love in a Greek salad. 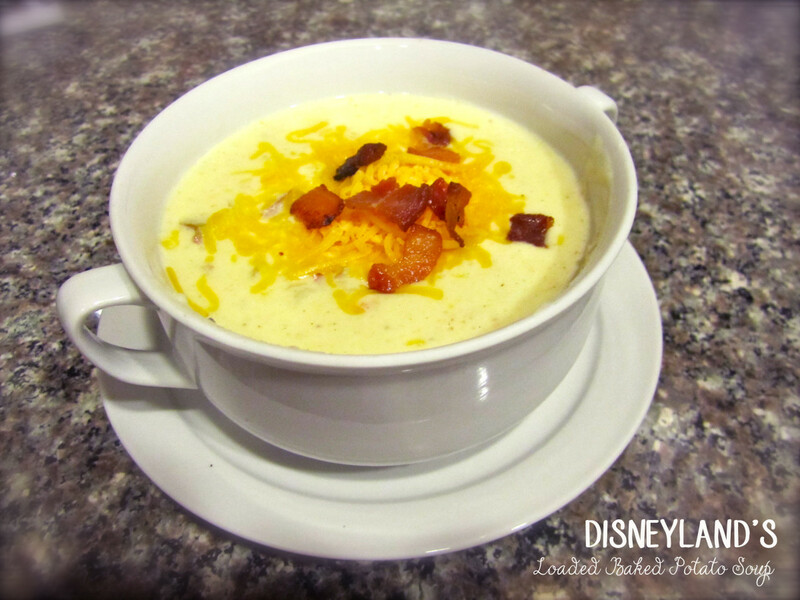 low-fat Cheddar cheese sauce from Cooking Light Magazine. Nachos are corn or flour tortilla chips topped with everything you love in a taco. 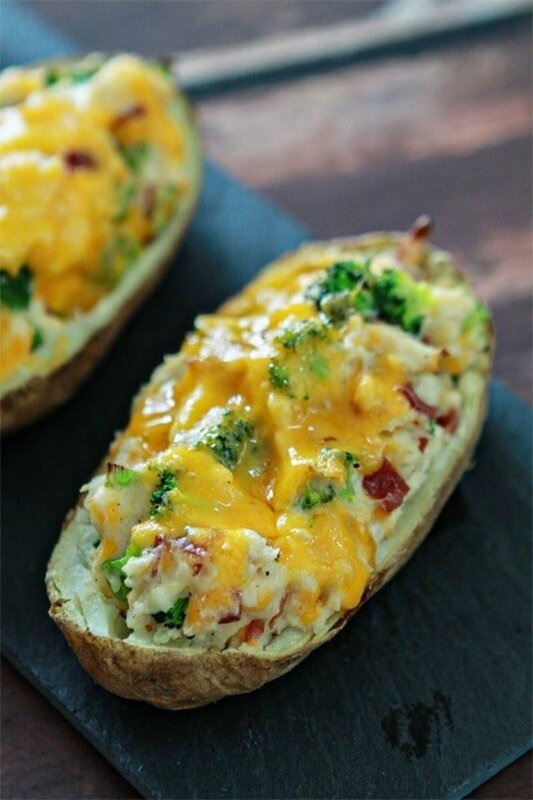 Why not try those same toppings on a baked potato? Julia Child gave us "Mastering the Art of French Cooking", and taught us how to poach the perfect egg. Topping a baked potato with a poached egg makes a satisfying and quick-to-fix vegetarian meal. 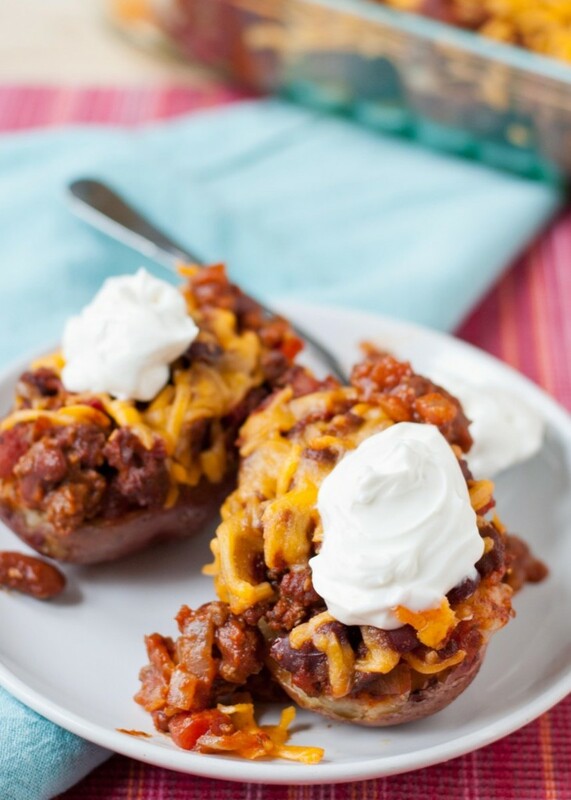 Watch your favorite team at home, heat up some chili, and enjoy a hearty baked potato. Use this tasty recipe from NeighborhoodFood or canned chili. What makes a messy potato? How about cooking up a batch of sloppy joes but ditch the bun and use a fluffy baked potato instead. Cook turkey in large sauté pan over medium heat until no longer pink; drain. Stir in remaining ingredients. Bring to a boil; reduce heat, cover, and simmer 30 minutes. What is poutine? Yes, the name is French; this dish of pomme frites (French fries) covered with gravy and cheese curbs originated in Quebec, but it is now a favorite comfort food in Wisconsin too (where the best cheese curds on the planet are made). What makes this "lazy"? 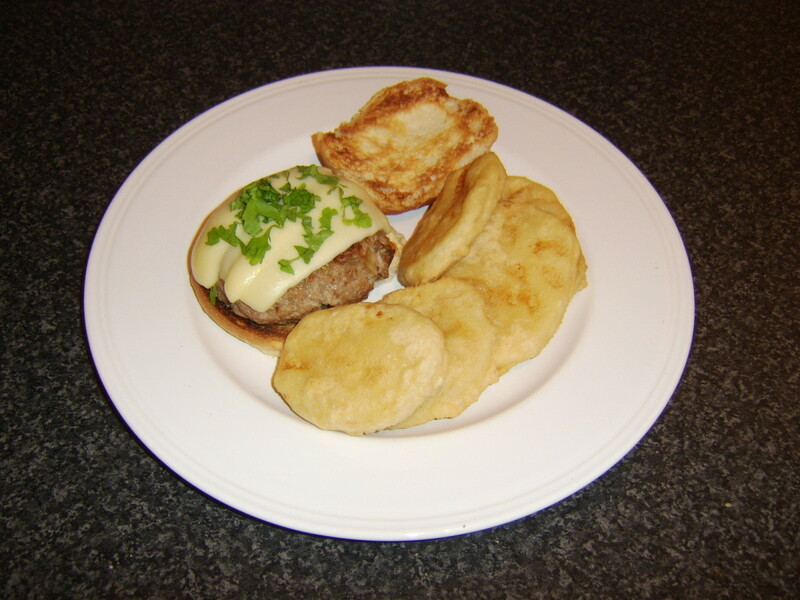 There is no real cooking involved; simply use leftover gravy or even from a jar. Trust me. This one is great the day after Thanksgiving. Leftover turkey, some turkey gravy; it's so easy you might feel a bit guilty. Perhaps a bit silly, but so good. Summertime is barbecue time. Hot and salty pulled pork plus crisp cole slaw; a great combination of contrasts. 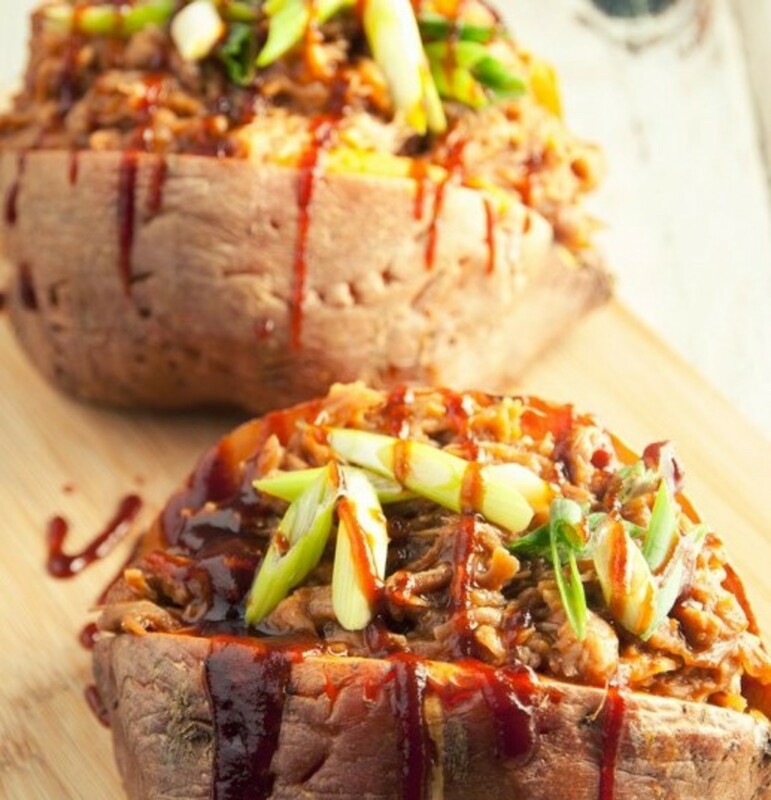 The food blog PaleoLeap.com uses a baked sweet potato as the foundation for their pulled pork. I think a baked russet potato would work equally well, or you could try this great recipe for pulled pork and slaw from Tyler Florence on The Food Network. Buffalo chicken without the mess; the amount shown below is for one potato. Heat chicken in the microwave. Toss with melted butter and buffalo hot sauce. Spoon on top of the potato and garnish with crumbled bleu cheese. When I think of Northern Italy, I remember the fresh seafood and the tangy Parmesan cheese. Warm some cooked shrimp in your favorite Alfredo sauce. Add a simple green salad and you have a complete meal. Smoked salmon or lox; perfect on a bagel, or on a baked potato. Follow this easy recipe, May I suggest a few capers on top? Preheat oven broiler and set the oven rack to 5 inches from the heat source. 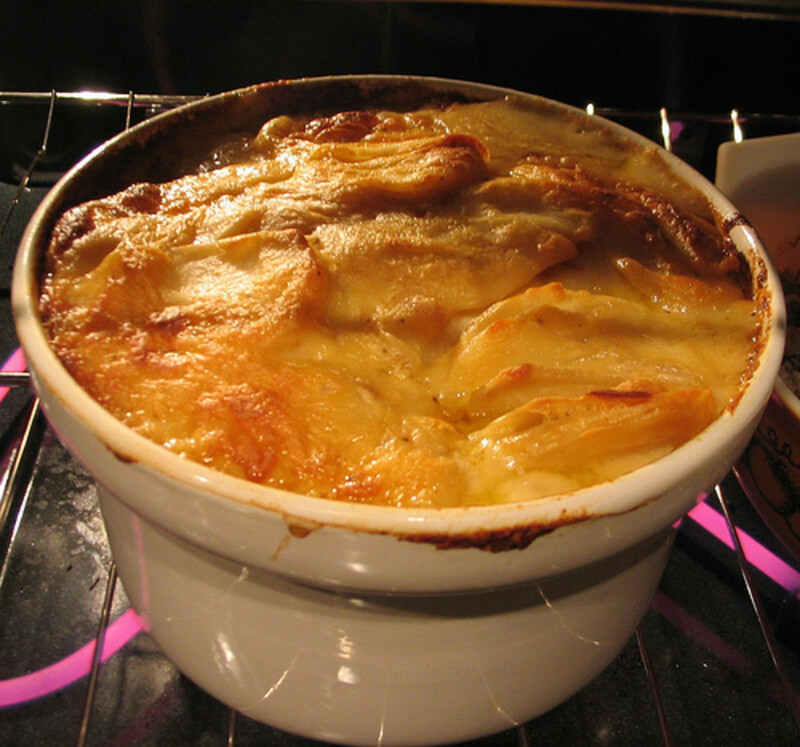 Combine all ingredients except the cheese in a medium-sized mixing bowl. Evenly distribute over 4 baked and split potatoes. Top each with 1/4 cup of the cheese. Broil 3 to 5 minutes or until cheese is bubbling. Watch carefully so that it does not burn. 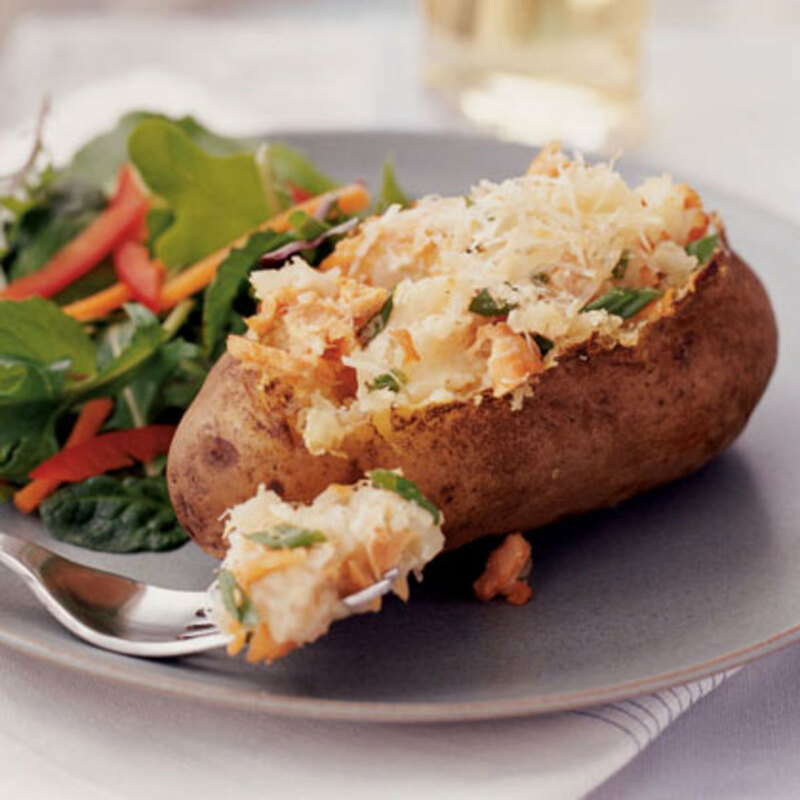 Fifteen ideas for topping a hot baked potato to turn a simple side dish into a hearty meal. Do any of these sound interesting? Which of these ideas might you try? 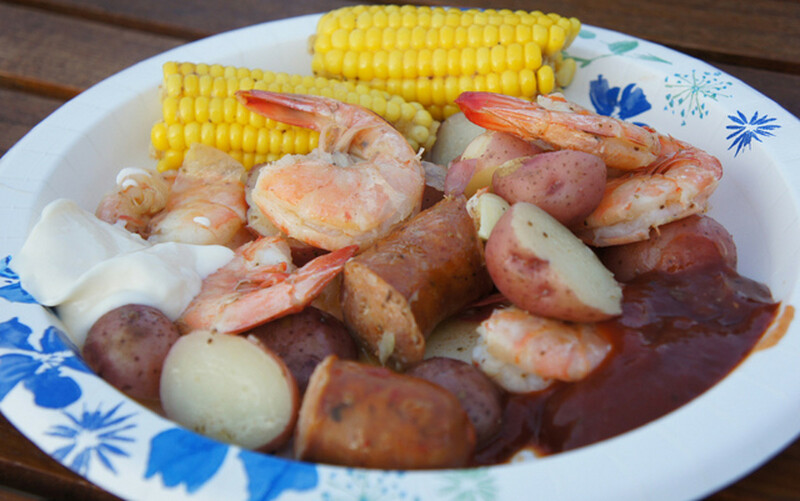 4 Recipes for Potatoes, Taters, Spuds, or Whatever Y'all Call Them! Recipes 1, 2, 3, 7 and 12 appeal to me. 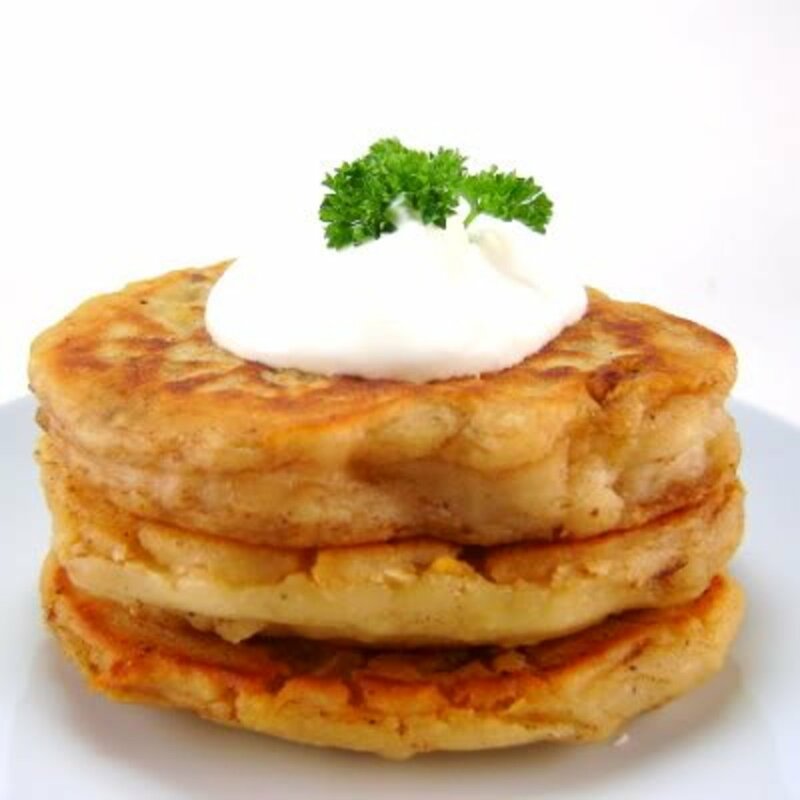 bravewarrior - I am glad that you found this hub and that it has given you some ideas for cooking for 1 or 2. I have no problem with red skinned potatoes. They cook up sweet and creamy. 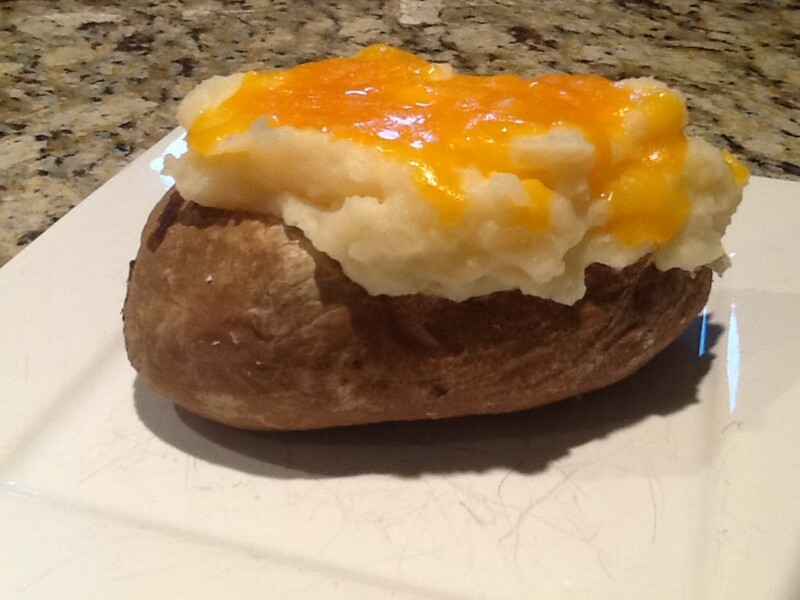 Not the texture that I typically crave when having a baked potato, but if you like them, go for it! Which topping(s) might you choose? What a wonderful idea! This is perfect for me. I don't cook much anymore because it's just me and my son, who's not home much. So when I cook I end up eating leftovers for a week! I do, however, use red potatoes. I poke holes in them but don't put any oil on them. The skins come out crispy and the centers tender. As I've mentioned before, I just don't care for the grainy texture of russet or Idaho potatoes. Hi Flourish - I see that you have also created a new hub. I'm totally brain numb right now (drove across State and back in two days), and so am saving it for my morning coffee tomorrow. I always love your tunes hubs. As for the baked potato--I'm on your side (of course. I wrote an entire hub on potatoes!). I must confess that I have not tried all of the options I presented above. But I know enough about cooking to know what ingredients and flavors work well together, and what proportions are needed. I love this! I've never met a baked potato I didn't like. Very creative dress up ideas. @carb diva good morning to you too. Yes I'm new and I must say I like it here. Thanks. I was doing a piece on jerked chicken last night, fell asleep and the entire thing got deleted. Will definitely do it over. RenWrites - Good morning and welcome to Hub pages. I see that you are new. I hope that you enjoy what you find here. Looking forward to seeing something from you. Thank you for your comments. This sounds really delicious and I looooove potato so I will have to try. Thanks. Eric, I do hope that you find the time to try one of these recipes for your family. The chili or sloppy joe version seems to always be a hit with kids. Bill, I agree. A baked potato is pure comfort food. Wonderful ideas and delicious sounding recipes. I love a good potato perhaps I will treat my family to a couple of these. Audrey - Thank you. I knew we were kindred spirits. I LOVE baked potatoes. We had then shrimp/alfredo version tonight. Thanks for stopping by. This is one of my absolute favorite foods on earth--and I learned something new--I had always used foil, but what you say makes real sense!